Street Parking along Lakeshore Road East, Reynolds Street and Robinson Street. Ricarda’s Oakville is a restaurant in Old Downtown Oakville that pairs modern Mediterranean-inspired fare with charming hospitality. Serving lunch, dinner and all the important eating times in between, our broad offering includes takeout, office catering and events. 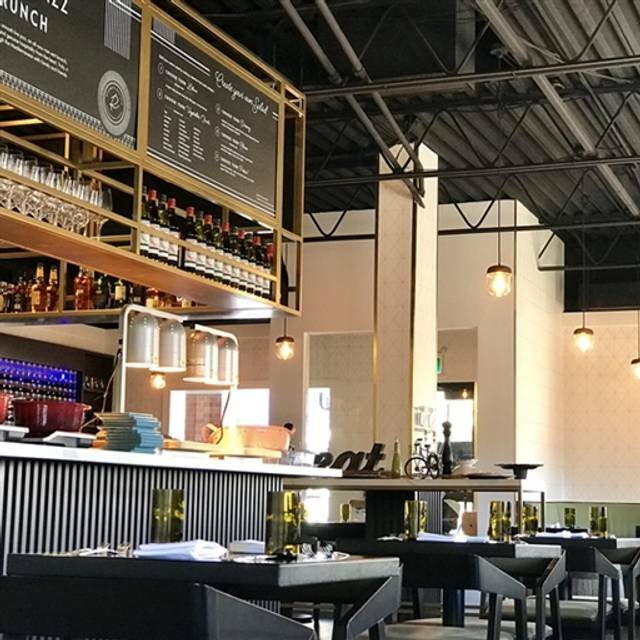 Inspired by the Mediterranean way of life, and designed for any time of day, Ricarda’s serves authentic Mediterranean fare with modern day classics. Our genuine service is both intuitive and thoughtful. Knowledgeable staff deliver a hospitality experience using the finest that Spanish, Italian, French, Greek and Canadian cuisine offers in food and drink. Liked the restaurant for the ambience, the menu, and the service. 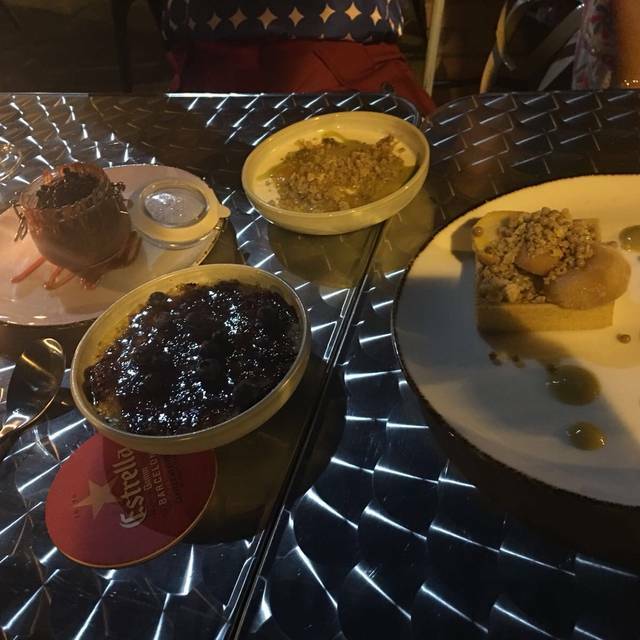 I was disappointed to find they did not offer tapas anymore, and they were being removed from the menu. I founds the food a degree off from how it sounded on the menu, and recommended by the server. Would have been so much better if the food tasted as good as the menu invoked thoughts of. The octopus appetizer....the octopus itself was delicious...the sauce accompanying it was almost too strong and rich for the octopus imo. The risotto was a disappointment. It was bland, did not contain the calamari I was expecting, and the salmon was just a bland after thought on top of the risotto. The sourdough bread sandwich was tasty...not sure again that it contained the porchetta that was stated on the menu. The tabouleh salad was a green salad with some couscous included...far removed from what tabouleh is. The restaurant was very quiet for a Thursday evening in DT Oakville. I’m sure the road closures on Lakeshore in the DT Oakville core will affect business greatly until construction is completed. Adele we thank you for dining us and appreciate your feedback; we’ll be sending your notes to our kitchen team , as we always love learning from our individual guests’ food tastes. We hope you’ll dine with us again in future, when the construction is done and our patio is open! Our third time back and the most positive experience. Ambience could be improved by dimming the lights more. Service was good but our server was a bit low energy sarcastic. Debbie, thank you for continually dining with us and being a part of our Oakville community. We’ve sent your note about lighting to management as we know atmosphere is very important to our beloved guests, as it is to us! We hope to see you again soon, perhaps on the patio once it’s just a touch warmer out there cheers! I wanted to love it here, the place is very nicely set up. I had made a Reservation arrived early & was seated in front corner table. Very nice. When music started it was difficult to hold a conversation. Too loud. Yes, I was aware of the Jazz music on Sunday. My friends eggs were runny& cold, she told me later. It was my treat for her recent Retirement. We asked for cream for our coffee, got 2% - had to ask AGAIN, as well No top up of Coffee, we had to ask. My Bens Eggs were fine, extra charge of $7.00 for small fries seemed steep. They were delicious. Hostess excellent, Natalia nice but large 60th Party must have not helped. The buffet was not at all appealing. Hi Stephanie, we thank you for coming by and giving us a try! Your feedback is much appreciated as we love to learn all that we can from our reviews. We find the majority of our customers are thrilled by the All You Can Eat portion of our Sunday brunch spread, so we’re curious of there is an email we can reach you at, to discuss what you would have liked to see? Again, we want to learn all that we can, and ensure all our guests feel taken care of at Ricarda’s. Thank you in advance! Absolutely A++++!! We will be returning. Delicious food, beautiful atmosphere, caters to children with a play area AND live jazz! Hi there, we’re so glad you came and spent time with us, but we certainly think our service impresses, it’s what Ricarda’s prides itself on! Might we ask for a few more details of your experience, so our team can learn from your feedback? We hope to see you in the future, perhaps for a nice cold drink on our patio once the weather finally turns around ; ) Cheers. Dinner for two early on a March Saturday evening. We were welcomed warmly, served promptly. Lovely ambience, yummy food. We’ll be back for sure next time we are in the area! Thank you, Ricardas, highly recommend! Thank you Ginger, you’re a gem! See you soon, cheers! Amazing restaurant, great food, and great service. Natasha and Natalia were awesome. Definitely coming back. Lunch menu had loads of options...Would highly recommend saving room for the sticky toffee pudding...new twist to an old favourite! This is a great environment for meeting with friends for a drink or colleagues to discuss business. I was very happy with their service and the food was excellent. Will definitely be back. The food is so fresh and tasty. Creative and inventive combinations. Staff is fabulous (and I am hard to please). 10/10. We are very proud to have won you over VivJ : ) Do visit us again soon won’t you?! The food was absolutely fabulous - it was a creative mediterranean blend - not the typical which was a pleasant surprise. They have fun creative cocktails and the service was warm and welcoming. We think you’re pretty fabulous as well PJOclair! We’re thrilled you had what sounds like a lovely dining experience with us; do visit us again soon (we’re looking forward to summer cocktails on our patio in just a few months)! Hi there, it sounds like you joined us for our Sunday All-You-Can-Eat Jazz Brunch! It thrills us that you enjoyed yourself and we have sent your note about the band’s volume to our management team; thank you for providing feedback! It’s how we learn : ) Cheers. Ricarda's never disappoints! Love the food, wine selection & the staff! We’re so proud to get this message LorrieC, and are so grateful you are a part of our Oakville community. We look forward to hosting guests like you for many days to come! See you again soon! Hi there, we are so grateful you came and tried us out, but are sorry to hear how you felt about your experience. We are proud of our team and our atmosphere, so we are quite surprised to read your review; can you share your email with us so we can chat further? We’d like to learn all we can from you and your review – thank you! Thank you for the review : ) We so appreciate the stars! Do visit us again soon, perhaps for our Sunday Jazz Brunch! Cheers! Booked Valentine's with my wife at the last minute at Ricardas with no idea what to expect. Clean and modern and the food was great with very friendly and quick service. Loved it! Amazing Anthony! Your review brings us such joy. We are thrilled we gave you and your wife a lovely Valentine’s Day experience and we looking forward to hosting you again in the future! When we first walked in, Megan greated us promptly and asked if she could coat check our coats, very classy. We were than seated and offered options and suggestions. We went with the brunch buffet option and the food was amazing! Overall 10/10 for food, service and experience. Thank you Megan. Hi there, this review is music to our ears! We work hard to make sure every guest is welcomed warmly and feels comfortable in our space. Your review lets us know we are getting it right. We look forward to hosting you again, cheers! Very generous sized portions and the wild mushroom risotto was incredibly creamy and tasty with hibiscus salt. I didn’t think I would manage to find the space to eat it all, but when something is so delicious, it is hard to resist. There was a little bit of a draft in the restaurant so I just recommend bring some layers during the winter months. Well worth a visit, especially during the taste of oakville! Karishma thank you! 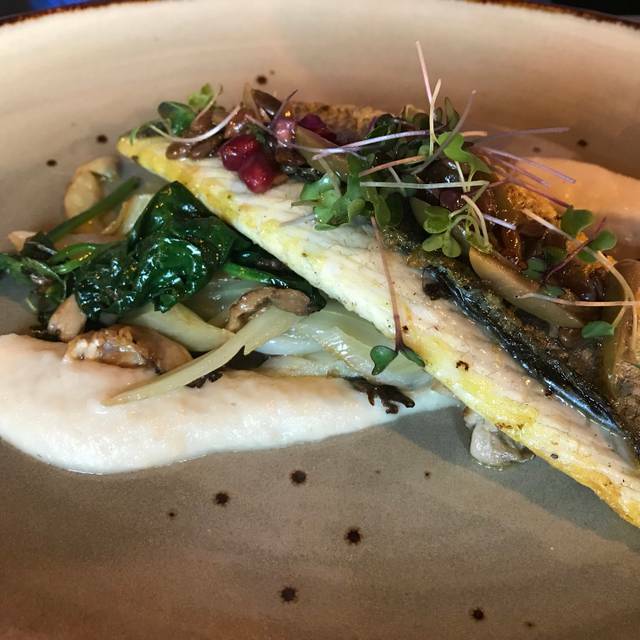 This review sparks joy for us as the mushroom risotto is also one of our favourite dishes on the menu ; ) A hearty dish made with fresh, quality ingredients; what more could you ask for? We have shared your note about the draft with our team, and we hope to see you again soon, perhaps this summer on our patio! Cheers! The food was amazing. The waitress was outstanding. She knew the menu and made suggestions that made for a great experience. We Will be going back regularly. Thank you for your review, we will be sharing it with the team as we know it will make them beam with pride! Reviews like this from happy customers such as yourself are what make us love what we do! Stopped by for a quick lunch on my way out. The porchetta sandwich was so good. Servers are friendly and attentive. My wife and I love this restaurant. We love hearing this : ) Thank you for leaving us this review and sharing your experience. We look forward to hosting you and your wife many times over, cheers! The service was excellent,the food delicious and imaginative. The live Jazz really made the experience memorable. I want to pop in every Sunday. We had a great brunch at Ricardas. I was amazed by the price and loved the Jazz playing in the background. Overall, an excellent experience. 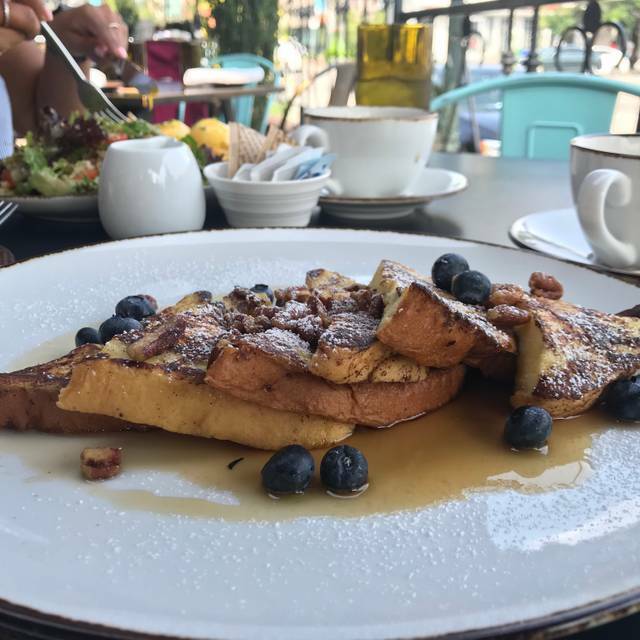 JacquelineK this is music to our ears, bringing Ricarda’s Famous Sunday Jazz Brunch to Oakville was very important to our team, and we’re learning how important it is to the OV community! Guests like you make it all worth and are why we do what we do – come back anytime, cheers! Hi Patricia, we have received and responded to your reviews of your experience with us on NYE on both our Yelp & Trip Advisor listings and as mentioned would love nothing more than to make this right with you. If you’re comfortable please reach out to us here with an email that we can reach you to get you in contact with our management team. We have been to this restaurant twice in the last couple of weeks. Once for lunch, once for dinner. I really like that there is a different menu for each. The menu is varied and unusual, which is excellent because there were many offerings our group liked the sound of, so we will be back to try them in future. At dinner there was a weird infestation of fruit flies?? They were annoying but didn't spoil our evening. We were given complimentary dessert. Hi VickyF, we are so happy to hear you have dined with us on multiple occasions and have plans to return! The building did have an unfortunate pipe issue, due to circumstances beyond our control, that affected us around the new year; we wanted to ensure that this issue has since been resolved, and we look forward to hosting you again and again (and again!) in the future, cheers! There were too many flies (fruit flies) interrupting our brunch. It was pretty ridiculous. They settled in our coffee, in our food, the kids didn’t want to see them in the bathroom. The food was sub par. We found the croissants to be quite tasty, but that’s it? Why would you tell parents after the brunch that if their kids had the all you can eat brunch, it would be free?? This place has potential, but there is a weak link on the team, this person needs feedback! Hi there, we so appreciate you taking the time to write a review; this doesn't sound like the type of experience we strive to share with our guests. The building did have an unfortunate pipe issue, due to circumstances beyond our control, that affected us around the new year; we wanted to ensure that this issue has since been resolved, but we'd like to get in touch so we can make this right with you. If you have the time, would you share your email with us, so we can connect you with management? The food and service was amazing, well worth going !! We had a great dinner, very good food and friendly service. I had been to Ricardas in Toronto for the Sunday Jazz Brunch. The music was great but it was very loud given there is nothing to absorb the sound, therefore, making conversation difficult. I found the location in Oakville, although substatially smaller was better for sound. we could all have conversation and enjoy the lovely jazz music in the background. Staff were excellent and Alejandro ensured we were happy and well taken care of. Thank you. Wonderful evening with food and attentive service. This was a delightful experience and we all felt very well looked after. Thank you! Another great meal. The new menu is fantastic had a sea scallops starter that was well seasoned and done perfectly. I can honestly say I’ve never experienced anything like this before in all my dining experience. The food was terrible, the service was awful, the restaurant was freezing cold, the music was far too loud and it was way too expensive. Thoroughly disappointed. Would never recommend this place to anyone. Sad because I typically like to support local businesses in my community but I will not be coming back. The concept of creating your own salad was good but the execution was terrible and for $25/salad I had a much higher expectation. Hi there, we are truly surprised to hear about your dining experience with us; it doesn’t sound like Ricarda’s and we’d like to make this right with you, and to show you all that we are so proud to be offering to the Downtown Oakville community. If you have a moment, can you share your email with us, so we will connect you with management? Thanks in advance. I did a "Build your own salad and the greens I chose were not available so they substituted without telling me and I did not enjoy what I got. They also eliminated another item which I noticed was present in my friends salad. I believe they mixed up our greens completely. In all fairness to Ricarda;, they did agree to compensate for the error but I told them it was not necessary. It was my friends birthday and they offer a discount on the price of the birthday person's meal. Dessert was lovely and they also substituted a very nice wine as they were out of the one we ordered. I would definitely go back and would recommend it. I loved the idea of building your own salad. Janet thank you, you are our dream guest; One who lets us know during their visit what we are getting right and what needs to be fixed to ensure you have the best experience with us as possible. We look forward to you next visit, cheers! We went for a small work party and it was just great! The food was amazing. We are all foodies and would definitely be back. The wine selection was wonderful, they had Gluten free bread which was delicious. We are looking to go back soon. The best value is the sharing meals for two people. Plenty of food and all delicious. 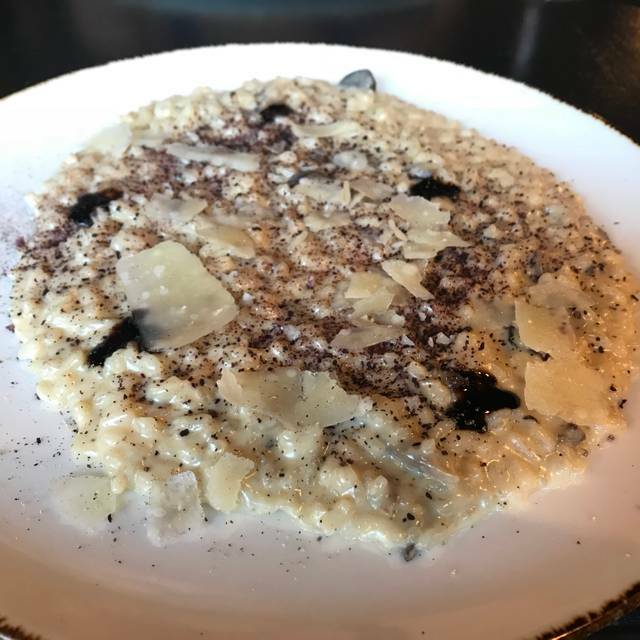 Extraordinary risotto. Great special- occasion restaurant. Had a team lunch at Ricarda's. Great for casual business meetings, brunch, date nights. The restaurant is tastefully decorated. Server was polite. The food was delicious. Will be scheduling more business meetings here in the future. Really good food and ambiance. Also loved their Toronto location. Great service. Good wine . Sea bream was delicious and the Creme Caramel divine. Nice touch with the discount to the birthday girl . We will definitely return.